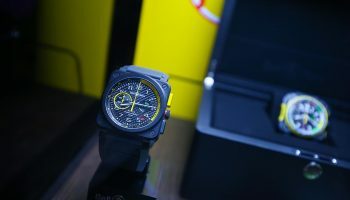 The BR-X1, a high-tech chronograph with sporty looks, which is as robust as it is sophisticated, marked the arrival of a new Bell & Ross line and the beginning of a whole new chapter in the saga of the brand. Revolutionary in its design and also inspired by aeronautical flight instruments, the BR-X1 line expands with a new exceptional Haute Horlogerie version: the Bell & Ross BR-X1 Chronograph Tourbillon. This precious measuring instrument combines the extremely virile aesthetic codes of the brand with the technical refinement of Bell & Ross’ Haute Horlogerie. 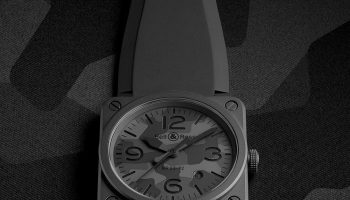 An armoured, ingenious, muscular and technical watch, the BR-X1 has always stood out thanks to the innovative design of its 45 mm multi-material case. 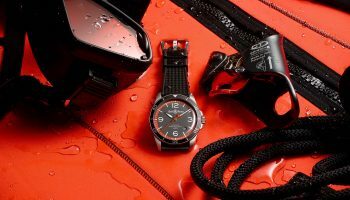 The functional, non-indexed screws, the single-piece structure of the case and the rocker pushers for the chronograph functions were designed to contribute to the sturdiness and ergonomy of the watch. A «thumb rest» insert is integrated at nine o’clock for optimised handling when activating the chronograph functions. 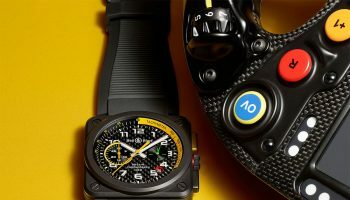 The ultra masculine and revolutionary architecture of this new generation go-anywhere timepiece allowed for infinite combinations in the design phase opening up a vast potential for creativity. The new BR-X1 Chronograph Tourbillon is the ultimate symbol of Bell & Ross’ watchmaking expertise and the first chapter of an evolution that combines grand complication and faithfulness to the aeronautical inspiration that the brand cherishes. 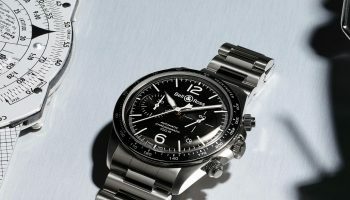 Complication version of the BR-X1 be a chronograph, the complication par excellence in aviation. Used to measure short times, it is an indispensable tool for aeronautical navigation. This traditional complication is here reinterpreted with the refinements of Haute Horlogerie and the very genuine desire to lighten the watch. 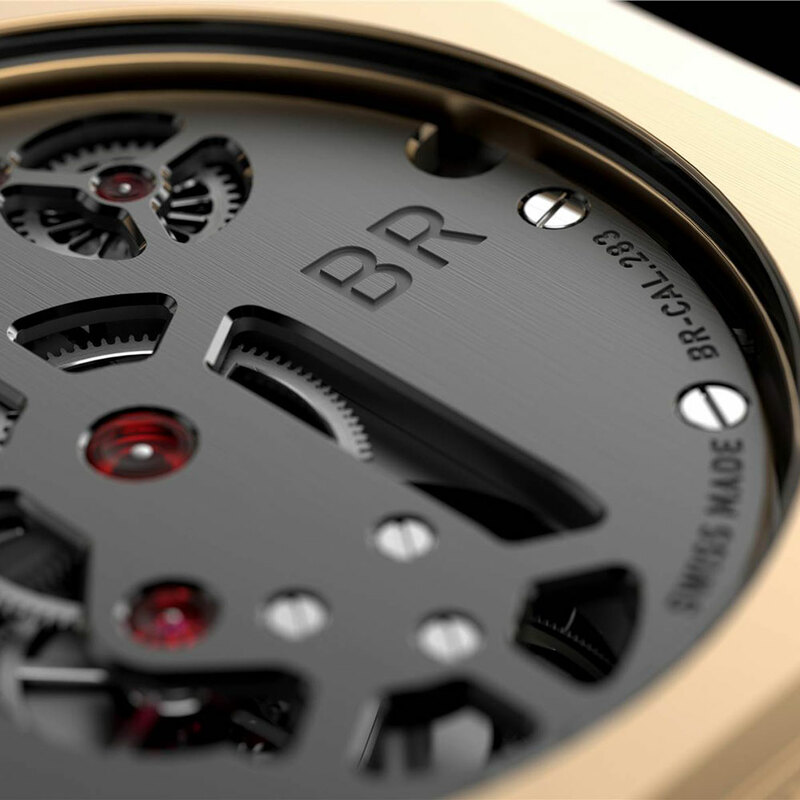 The top of the range model of the BR-X1 range required a luxury watch movement, so Bell & Ross has developed a manual wind Skeleton Tourbillon Mono-Pusher Chronograph. This Haute Horlogerie grand complication movement is a marvel of technology consisting of 282 components and 35 rubies that beat at 21,600 vph. Packed with high-tech sophistication, the Bell & Ross BR-X1 Chronograph Tourbillon is available in two versions: grade 5 titanium or rose gold, with or without diamond setting. Ultra light and very durable, the grade 5 titanium model, with its various shades of grey, is the more virile looking. 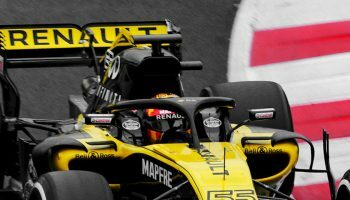 Grade 5 titanium is a grade of titanium used in aeronautics, developed for its superior properties in hardness, durability and resistance to corrosion, erosion and high temperatures (stable up to 600°C). Grade 5 titanium alloy is an alloy reinforced with vanadium and aluminium to make it 40% lighter and 60% harder than steel. In its “fuselage” of 18 carat rose gold, the BR-X1 Chronograph Tourbillon places greater emphasis on elegance and its precious aspects, without losing an ounce of its technical features and sturdiness. It offers a more delicate appearance to the virile shape of this ergonomically proven ultimate professional tool. Both versions are also available in jewel-encrusted versions: 46 baguette-cut diamonds (2.3 carat) set into a grade 5 titanium bezel for the titanium model and 46 baguette-cut diamonds (2.3 carat) set into a titanium rose gold bezel for the rose gold model to bring a very special sparkle to the wearer.